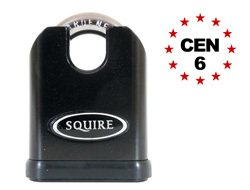 This closed shackle padlock has the highest possible security rating and tested to a CEN grade of 6. For more information on these test grades please see our CEN insurance page. It has the maximum protection available against force attacks using bolt cutters, hack saws and hammers. The body is made from hardened steel electophoretically coated to provide excellent resistance to the weather. These locks have been tested to over 200 hours of salt spray and therefore ideal for outdoor use. Please note however this is not a marine grade padlock. Please see our weatherproof range for these. We currently offer only one size of Keyed Alike Closed Shackle Stronghold Padlock. Many insurance companies require padlocks which are of a CEN Grade of 4 or higher. 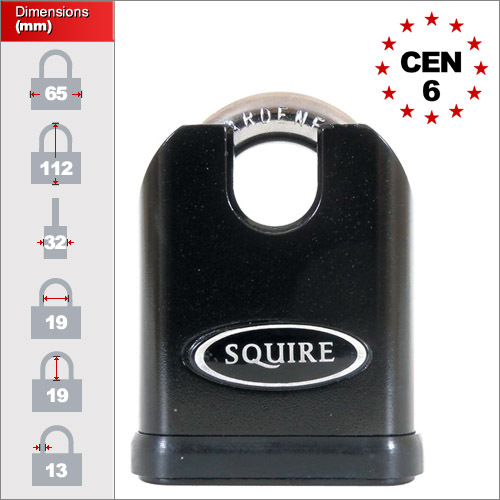 This padlock affords a rating of 5 and is suitable for almost all insurance company requirements.